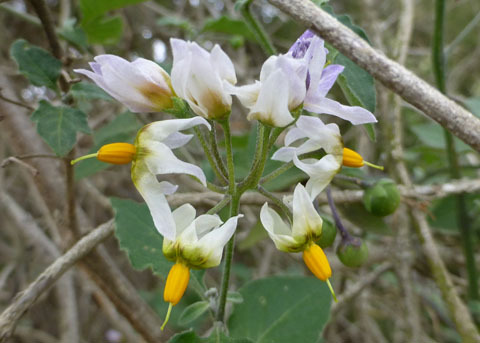 The calyces are deeply 5-cleft; 5-lobed corollas are white, often with blue-purple tinge and a greenish basal splotch; there are 5 short stamens with yellow anthers that form a conical ring around the style which protrudes beyond the stamens. UCI Ecological Preserve, Irvine, CA. 3-31-10. © Joan Avise. 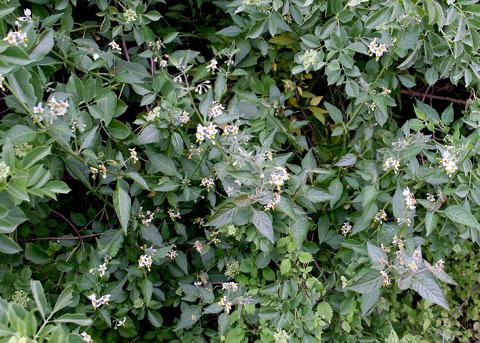 A short-lived, much-branched, 3-6 ft. high perennial shrub; widespread and common, especially in shade, along streams and moist slopes in riparian and scrub habitats. 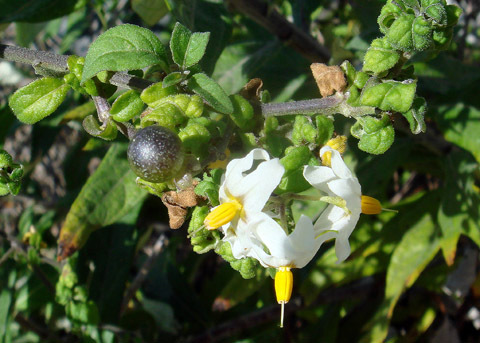 Solanine, a glyco-alkaloid, found throughout the plant is extremely toxic. Propagated by clonal development and seedlings (Clarke). 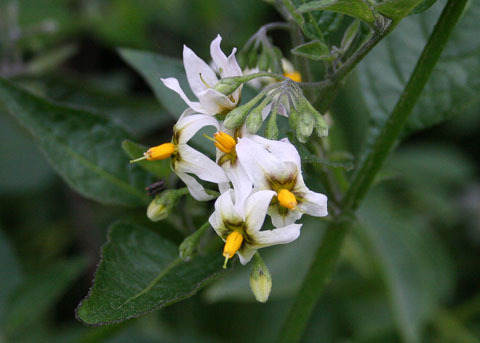 Closely resembles Black Nightshade (S. nigrum) and S. americanum, which have much shorter anthers. 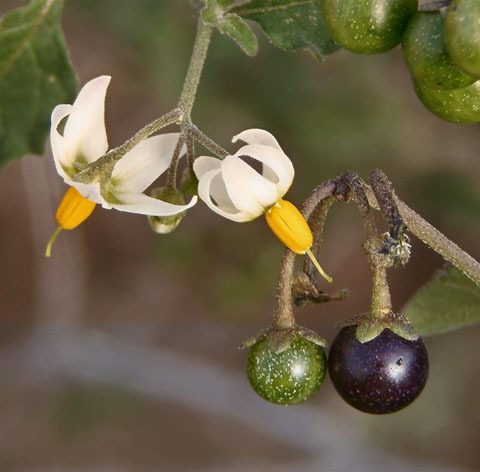 Cahuilla Indians used juice of the berries for tattooing and to cure inflamed eyes. Flowering: year round. 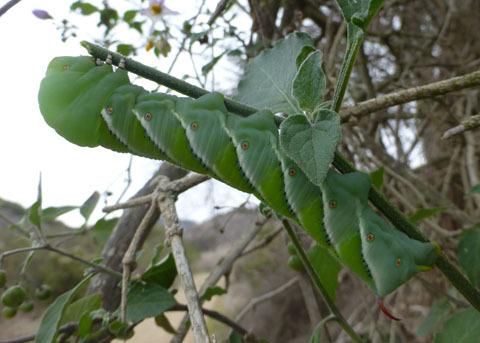 Leaves are from 1-4 in. 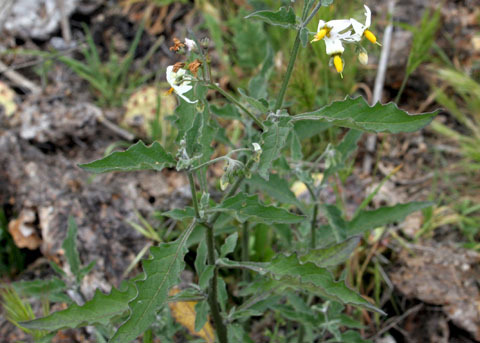 long, alternate, wavy-margined and sparingly toothed; petioles up to 1 in. long. San Joaquin Wildlife Sanctuary, Irvine, CA. 5-7-06. © Joan Avise. UCI Ecological Preserve, Irvine, CA. 3-31-10. © Joan Avise. The fruit is a green to black poisonous berry, 1/4 to 3/8 in. diameter. San Joaquin Wildlife Sanctuary, Irvine, CA. 8-20-11. © Joan Avise.